Membership manager and steering committee member of The Pet Professional Guild British Isles and co-partner and faculty member of DogNostics Career College, Professional Canine Behaviour Consultant – Accredited through the Pet Professional Accreditation Board, Fear Free Certified Professional, Louise Stapleton-Frappell, the owner and head trainer at The DogSmith of Estepona, was born in Yorkshire, England. She grew up surrounded by beautiful countryside and lots of animals. Border Collies, German Shepherd Dogs, and Chow Chows were part of the family home. Louise studied for her Bachelor of Arts Honours Degree at the University of Leeds and, after leaving University, took her first teaching post at a school in Cartagena. This was soon followed by a move to Southern Spain where she quickly added a beautiful German Shepherd x Doberman, Bess, to the family and thus began her love of teaching dogs as well as people. A local veterinarian put her in touch with a respected police dog trainer who passed on his knowledge and shared his love of the beautiful canines he worked with. A gorgeous Staffordshire Bull Terrier, Samson, was soon added to the family. He was followed by Louise’s present family members, Tessa and Jambo. Louise continued to follow her love of teaching dogs and furthered her education in the world of dog training. She discovered the world of dog tricks and shared her passion with Jambo, who, at the age of just 16 months, became the first Staffordshire Bull Terrier to become a Trick Dog Champion. Jambo has since been aired on Talent Hounds TV in Canada and was also featured as a Victoria Stilwell Positively Story. Louise has constantly built on her knowledge and furthered her education in the field of force-free, rewards-based, science-based dog training. She was one of the first twenty people worldwide to become a Professional Canine Trainer – Accredited, through the Pet Professional Accreditation Board. This was later followed by her accreditation as a Professional Canine Behaviour Consultant. Louise is also a Certified Trick Dog Instructor, Certified Whistle Recall Instructor and a DogNostics Fun Scent Games Instructor. She gained her CAP3 with Distinction (Clicker Trainer Competency Assessment Programme); is a DogNostics Level 2 Pet Care Technician; holds ITDH’s force-free Instructor Certification and The Pet Professional Guild’s Pet First Aid Certification, as well as verified certification in Animal Behaviour and Welfare (Edinburgh University) and Dog Emotion and Cognition (Duke University). Louise is proud to be a Pet Dog Ambassador Instructor and Assessor, a programme that acknowledges the hard work and commitment that guardians and their dogs undertake to make their shared lives enjoyable. The author and instructor of the DogNostics’ Dog Trainer Certification Program; the DogNostics’ Dog Trick Instructor Program, the Fostering Collaborative Care Partner Program; the Walk This Way Instructor Program, and TrickMeister Titles, Louise is also the co-author of The Top Ten Dog Training Knowledge Concepts and A Lexicon of Practical Terms for Pet Trainers & Behavior Consultants – The Language You Need to Know! Louise is a board member and steering committee member of The Pet Professional Guild; steering committee member and regional coordinator of Doggone Safe in Spain and co-presenter of BARKS Podcasts. 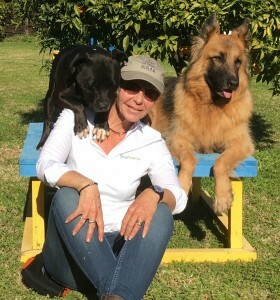 She is a passionate advocate of force-free training, promoting a positive image of the “Bully” Breeds and advocating against Breed Specific Legislation in favour of breed-neutral laws and education about dog bite safety and prevention. Louise has presented at conferences internationally and has gained a reputation for expertly teaching and training humans and canines at her own establishment The DogSmith of Estepona. She loves helping dogs learn how to be the best companions possible and loves teaching pet dog guardians the skills they need to increase the bond they share with their wonderful canine companions. Louise believes training should be both fun and stress-free and is passionate about making sure that you and your pets receive the absolute best training and care, along with exceptional customer service. I pledge to use my knowledge and skills for the benefit of pet owners and their pets. I will practice my profession conscientiously with dignity, and in keeping with the principles of The DogSmith ethics, mission, vision and values. I accept as a lifelong obligation, the continual improvement of my professional knowledge and competence.